Da Couch Tomato: Elementary. Episode 7: "One Way to Get Off"
Elementary. Episode 7: "One Way to Get Off"
And finally, an episode that gives us some back story on a character who isn't named Holmes or Watson. 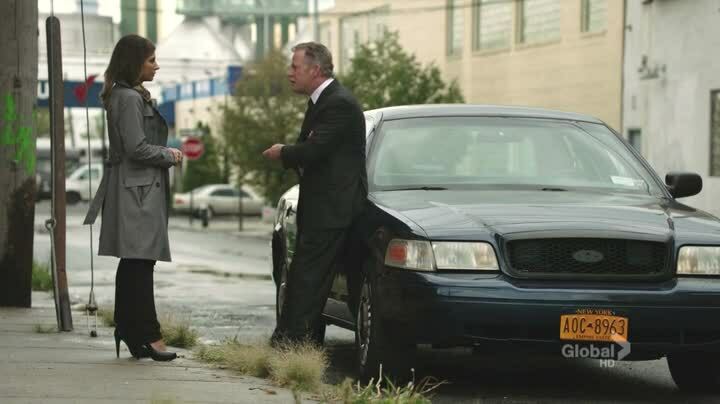 I'm talking about Captain Gregson, played by Aidan Quinn. "Seven episodes before you give me a back story?" So what is his back story? The answer: this entire case. Yes, this episode is about the seeming resurrection of the Wade Crewes murders, which Gregson handled years ago. There's also talk of evidence-planting, allegedly perpetrated by none other than Gregson himself. Or his former partner. I'm betting Gregson boned her. And also, we get more clues as to the identity of Ms. Irene Adler, who was revealed last episode. This time we find out that she died, that she and Holmes were quite close, and that he did not take her passing well. I don't think Irene is dead. I think he thinks she's dead. And whether it was intentional on her part to make him think she's dead, I hope we know before the Season ends. Elementary. 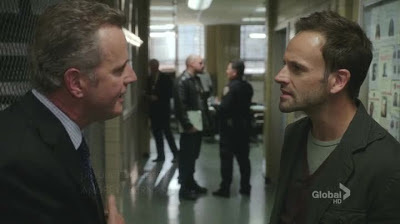 Episode 6: "Flight Risk"
Elementary. Episode 5: "Lesser Evils"
Elementary. Episode 4: "The Rat Race"